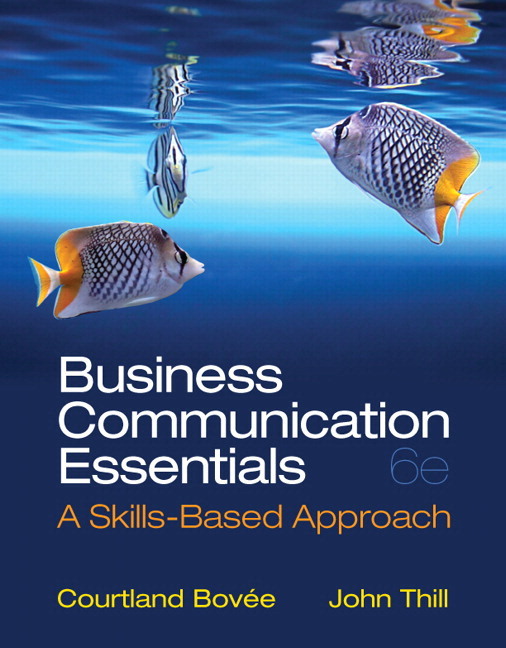 Business Communication Essentials equips students with fundamental skills for a career in the modern, mobile workplace. With comprehensive coverage of writing, listening, and presentation strategies in a contemporary context, this text balances basic business English, communication approaches, and the latest technology in one accessible volume. Over the last two decades, business communication has been in constant flux, with email, web content, social media, and now mobile changing the rules of the game. 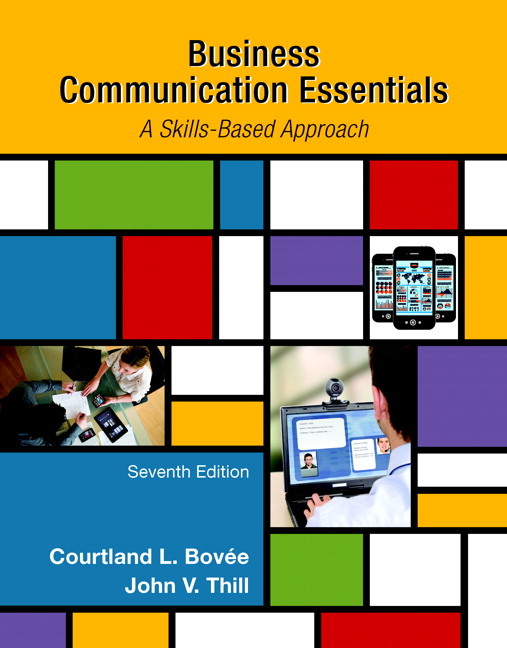 In the Seventh Edition, Bovee and Thill provide abundant exercises, tools, and online resources to prepare students for the new reality of mobile communications and other emerging trends, ensuring a bright start in the business world. MyBCommLab is an online homework, tutorial, and assessment program designed to work with this text to engage students and improve results. Within its structured environment, students practice what they learn, test their understanding, and pursue a personalized study plan that helps them better absorb course material and understand difficult concepts. The Chapter Warm-up helps you hold your students accountable for learning key concepts in each chapter before coming to class. The assignment consists of basic questions related to topics in the text , and gives students the chance to access their eText to read about the topics in question. Grading and item analysis in the assignment allow you to see what students know and don’t know. Dynamic Study Modules: Not every student learns the same way and at the same rate. Now, thanks to advances in adaptive learning technology, you no longer have to teach as if they do. Dynamic Study Modules assess student performance and activity in real time and, using data and analytics, personalize content toreinforce concepts that target each student's strengths and weaknesses. You can assign Dynamic Study Modules as homework and receive results right in your gradebook. And, because your students are always on the go, Dynamic Study Modules can be accessed from any computer, tablet, or smartphone. Enhanced eText: Engagement in lecture is essential to student success, and continuing that engagement outside of class is just as critical. The new Enhanced eText found within Pearson’s MyLab keeps students engaged in learning on their own time, while helping them achieve greater conceptual understanding of course material. Just as a great instructor brings course material to life, the Enhanced eText brings reading to life — with animations, interactive tutorials, and more. In the Enhanced eText, immediate practice suited to a variety of learning styles is just a click away. Business Today: Bring current events alive in your classroom with videos that illustrate current and topical business concepts. Reporting Dashboard: View, analyze, and report learning outcomes clearly and easily, and get the information you need to keep your students on track throughout the course with the new Reporting Dashboard. Available via the MyLab Gradebook and fully mobile-ready, the Reporting Dashboard presents student performance data at the class, section, and program levels in an accessible, visual manner. Branching, Decision-Making Simulations: Decision-making simulations put your students in the role of manager as they make a series of decisions based on a realistic business challenge. The simulations change and branch based on their decisions, creating various scenario paths. At the end of each simulation, students receive a grade and a detailed report of the choices they made with the associated consequences included. Video Exercises: These engaging videos explore a variety of business topics related to the theory students are learning in class. Quizzes assess students’ comprehension of the concepts covered in each video. Writing Space: Better writers make great learners—who perform better in their courses. Designed to help you develop and assess concept mastery and critical thinking, the Writing Space offers a single place to create, track, and grade writing assignments, provide resources, and exchange meaningful, personalized feedback with students, quickly and easily. Thanks to auto-graded, assisted-graded, and create-your-own assignments, you decide your level of involvement in evaluating students' work. The auto-graded option allows you to assign writing in large classes without having to grade essays by hand. And because of integration with Turnitin®, Writing Space can check students’ work for improper citation or plagiarism. Quizzes and Tests: Pre-built quizzes and tests allow you to quiz students without having to grade the assignments yourself. NEW! Comprehensive coverage of mobile business communication prepares students for the modern business world. NEW! Real-Time Updates, a dynamic element strategically placed throughout the text, connects readings to relevant media items online, including websites, videos, infographics, PowerPoint presentations, podcasts, PDFs, articles, and more. NEW! Examination of emerging workplace issues, including bring-your-own-device (BYOD) policies and digital fluency. NEW! Strengths and strategies for linear and non-linear presentations to help students plan, develop, and execute professional presentations. NEW! Revised treatment of media and channels, covering oral, written, and visual media choices along with digital and non-digital channels. NEW! Over 40 added examples and figures of business communication, including mobile and social media illustrations. NEW! Activities and exercises focused on mobile exchanges help students become acclimated to business etiquette and expectations across digital channels. Integrated “Improve Your Grammar, Mechanics, and Usage” workbook at the conclusion of every chapter to reinforce essential writing skills; complemented by the “Handbook of Grammar, Mechanics, and Usage” reference. Clear objectives open every chapter through the insightful “Communication Matters” element, highlighting core principles covered in that chapter. Reinforcing resources throughout the text, including “Test Your Knowledge,” “Apply Your Knowledge,” “Practice Your Skills,” and “Expand Your Skills” elements. Curriculum aligned to AACSB Learning Standards ensure rich learning experiences across a range of key skills; the American Association of Collegiate Schools of Business (AACSB) in a non-for-profit corporation devoted to higher standards in business education. Email hotline for instructors provides immediate answers to any questions or concerns. Business Communication Blog from the authors offer original articles and fresh resources, solutions, and activities to help instructors enhance their classrooms. Instructor Resource Center provides technical support and downloadable content, including the Instructor’s Resource Manual, Test Bank, TestGen® Computerized Test Bank, and PowerPoint Presentations. Comprehensive coverage of mobile business communication prepares students for the modern business world. Real-Time Updates, a dynamic element strategically placed throughout the text, connects readings to relevant media items online, including websites, videos, infographics, PowerPoint presentations, podcasts, PDFs, articles, and more. Examination of emerging workplace issues, including bring-your-own-device (BYOD) policies and digital fluency. Strengths and strategies for linear and non-linear presentations to help students plan, develop, and execute professional presentations. Revised treatment of media and channels, covering oral, written, and visual media choices along with digital and non-digital channels. Over 40 added examples and figures of business communication, including mobile and social media illustrations. Activities and exercises focused on mobile exchanges help students become acclimated to business etiquette and expectations across digital channels.